Obesity is a health condition in which a person’s body has too much fat tissue for it to function normally. Being obese increases one’s risk for a multitude of health complications and diseases, including several types of cancer. There are a few leading theories about which obesity-related conditions can cause cancer. These include chronic inflammation, higher levels of hormones such as estrogen and leptin, and an excess of insulin and/or glucose in the blood — all of which result in disruption or changes to normal cells, which may lead to cancer. Obesity has been linked to thirteen types of cancer with a stronger risk associated with breast, esophageal and endometrial cancers, among others. While many factors influence one’s cancer risk, maintaining a healthy body weight, or, losing weight if you are overweight or obese, is one way to help reduce that risk. 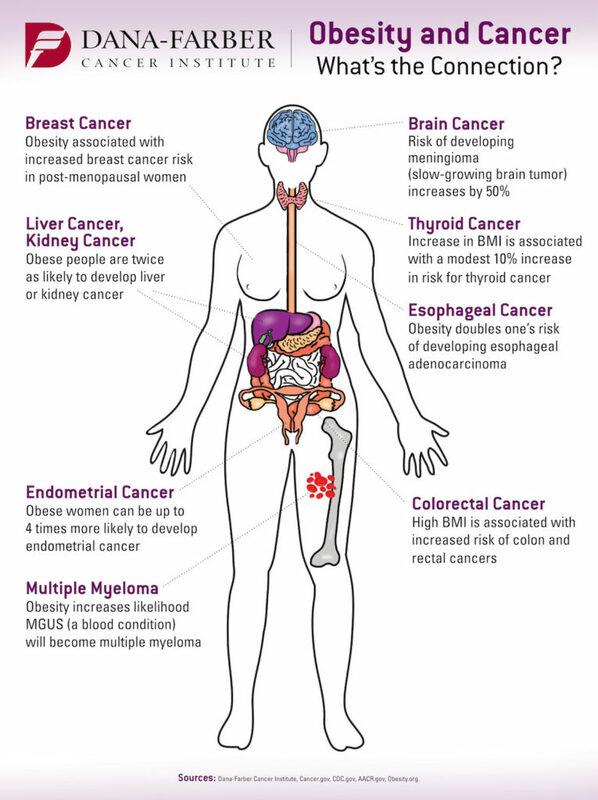 The figure above is not intended to represent obesity but rather to demonstrate parts of the body affected by cancer risk associated with obesity. Follow an eating schedule and don’t skip any meals or snacks to prevent overeating later. Fill up on nourishing, naturally low-calorie foods, such as fruits and veggies. The fiber will keep you full and help prevent overeating. Adjust your portions by using a smaller plate, which will make a smaller portion look bigger. Balance your plate by making at least half of your plate consist of vegetables and fruit. One quarter of your plate should be lean protein, and one quarter whole grains. Incorporate moderate exercise, if possible.